Developers Nation is a New Delhi based IT Services company. We specialize in Website Design and Development, Mobile App development, Digital Marketing and Blog Writing on the latest technological advancements. With more than 50 clients till date, the company has been consistently proving our efficiency to our clients by working on their projects like our own. Developers Nation Training Program focuses on creating multi-skilled and intricate developers with immense learning and goal of evolving into a leading company. Through our dynamic web portal, we help students of the startup age to keep learning about the running technologies and cope up with the fast pace of the digital world. The workshop will be held on the 14th of October 2017 about PYTHON. It will be conducted by Developers Nation, with the aim of keeping students updated about the knowledge of tech world in a fun environment with experts for a better learning experience. The speaker will be, Mr.Rakesh Kumar- the CEO and founder of RedInno. Rakesh Kumar is a tech enthusiast, researcher, and certified python developer. He has published 20 research papers, member of the PSF, IACSIT, SCIEI, UACEE, IAENG, CSTA etc. reviewer of GJCT Journal and RHCSA, RHCE, MCP and IBM DB2 Certified. His research interests include Scientific Computing, Cloud Computing, Big data, Hadoop, NoSQL, and NewSQL. The workshop will be of 7 hours. 10 a.m. - 10:15 a.m. – Introduction to workshop and Developers Nation Initiatives. 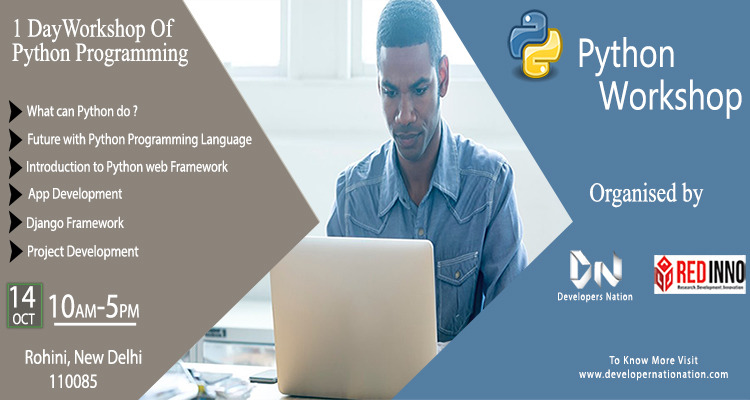 Future with Python Programming Language. What is Python, Why Python? Modes, Variables, Keywords, Identifiers, Literals, Lines and Indentation, Tokens, Statements & Comments, Quotation, Command Line Arguments, Python Operators, Operator Precedence. The workshop with certification fee of 500 is required. It comes with amazing benefits of immense knowledge, globally acceptable hand printed participation certificates and Internship/Job opportunities with Developers Nation and RedInno. The workshop has limited seats and hence, only the first thirty registrations will be provided with the certificates. Time 10 : 00 a.m. – 05 : 00 p.m.